PORT ORCHARD — Washington state residents living in rural forested areas, many of whom are still recovering from a spate of wildfires that burned many thousands of acres of forest land last summer, will likely need to prepare for another significant outbreak in the coming summer months. The federal National Interagency Fire Center in Boise, Idaho, issued earlier this month a sobering outlook of potential significant wildland fires beginning this month through July. 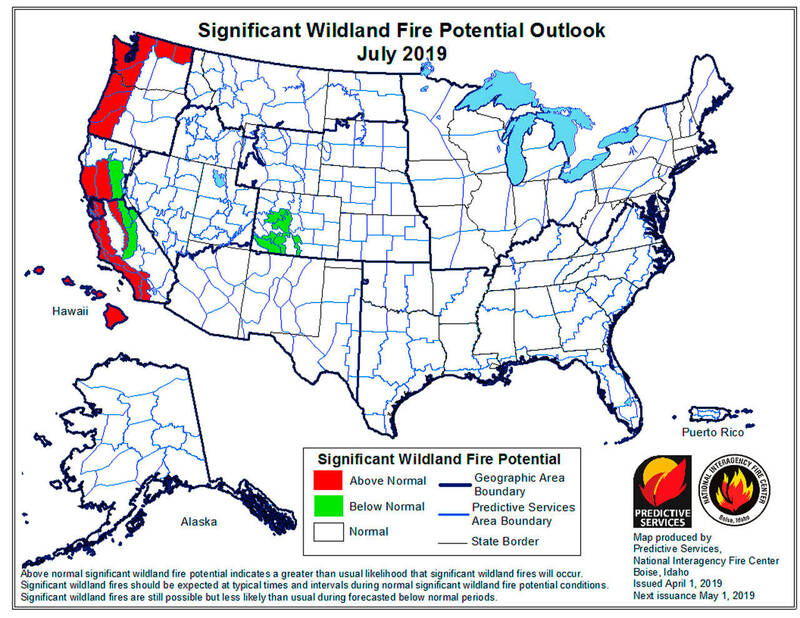 While the significant large fire potential remains normal across the Pacific Northwest during the outlook period, the center’s report indicates the potential for outbreaks west of the Cascade crest in Washington state and northwestern Oregon is above normal through June. The above-normal conditions will expand southward into southwestern Oregon in July. The outlook didn’t include projections for August and September, which are traditionally some of the worst months for wildfire activity. While the region was mostly cold in March, it was dry across the entire Pacific Northwest after a wet and cold February, the report noted. Snowpack for late March over the higher elevations at the end of the month was about 75 to 100 percent of normal across Washington. The report offered some positives about the risk of natural causes for wildfires; fire danger indices remain quite low for a significant risk of large, naturally ignited wildfires across the region. Human-caused fire activity in populated areas that occurred in March, however, indicates a potential exists for “escaped prescribed fires or accidents” in windy conditions during dry spells. As a result of the report, Washington Sen. Maria Cantwell questioned U.S. Forest Chief Vicki Christiansen about her agency’s efforts to reduce fire risks for the upcoming fire season. At a Senate Energy and Natural Resources Committee hearing April 9 to examine the Trump administration’s Fiscal Year 2020 budget request for the Forest Service, Cantwell highlighted the National Interagency Fire Center’s projections. “This is concerning to me that we are projected to be above normal as it relates to fire season,” Cantwell said. Cantwell pointed to bipartisan legislation she helped pass in the last Congress that provides hundreds of millions of dollars of new funding for wildfire prevention and fuel reduction programs. She asked Christiansen to ensure firefighting efforts continue to receive needed funding. The omnibus deal also ends the practice of borrowing funds to fight fires by establishing a contingency account for use in significant fire years. It has been funded with more than $2 billion a year through 2027. Another $100 million has been freed up for fire prevention projects and recreation programs. The senator also pressed the Forest Service chief about how new technology for firefighters can be implemented to lessen the impacts of fire season throughout the Pacific Northwest.